Here’s a great gallery of Battlestar Galactica characters drawn Simpsons-style. If you liked that, you might enjoy other sci-fi characters drawn Simpsons-style. Has it really been 6 years since the Matrix Trilogy? Here’s a nostalgic reminder of The Matrix, ensconced in history via the awesomeness of Lego. What a perfect example of scientific serendipity. The International Space Station just happened to be floating over “Matua Island, in the Kuril Island chain, northeast of Japan” just as Sarychev Peak erupted in a spectacular fashion. 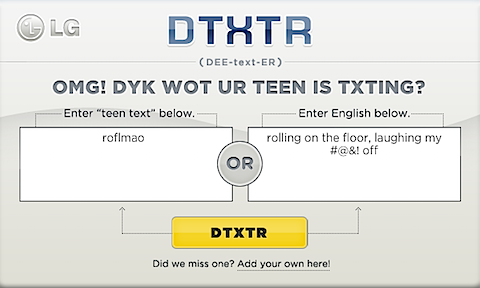 This is a completely serious website aimed at educating parents on the completely indecipherable SMS shorthand affectionately referred to as TXTing to the youth of today. In all seriousness, though, I think this is a potentially handy reference for people, IMHO. I’ve successfully updated my family’s respective iPhones to version 3.0 of the firmware. No horror stories to share from me, though I am a tad bit annoyed by the extra page of applications that was inserted to make room for the new Voice Memo app. Instead of just pushing the applications over by one to make room, the update inserted a blank page and pushed one application onto it. Bleh. There are plenty of articles on the interwebs describing the hottest features in the 3.0 update (like auto-authentication at any AT&T Wi-Fi Hotspot), but one upgrade that I didn’t see written about was how the iPod app handles audiobooks. There are two new buttons: one that rewinds you back 30 seconds, and one that increases the playback speed. I love this. How did the update go for you? Do you see anything unusual about the photo of the girl above? Really? Take a closer look. I’m already an Amazon fanboy, but now this Firefox extension takes my fanboy-ism to epically lazy proportions! I’m generally excited about the impending iPhone 3.0 firmware update, but I’m not excited about the removal of one of my favorite features: the ability to re-download any previously purchased application. Because of the relatively cheap (or free) price tag of iPhone apps, I’ve fallen into that demographic of playing with an app for a day or two and then tossing it if it isn’t useful or entertaining enough to keep around. The ability to grab these apps again at no cost from the iTunes Store makes “house-cleaning” a no-brainer for me—I can keep my “Applications” area in iTunes lean, clean and mean (since it does slow down noticeably when you have hundreds of apps). If Apple does decide to clamp down on this functionality, I’ll probably give-in to my packrat-ish ways and keep every (paid) app I download around “just in case.” Maybe I should copy them to 3.5” floppies just in case.